Do you live in a tropical , subtropical or temperate zone? Tropical bamboo may only be grown permanently outdoors in areas that are frost free. This is probably USDA Zone 10 only: areas like Southern Florida, Southern California and Hawaii. Tropical bamboo may be grown indoors or in greenhouse environments if care is given to maintain steady warm temperatures throughout the year. Subtropical bamboo are somewhat tolerant to frost. They grow well in USDA Zones 9 and 10 with marginal performance of some species in Zone 8. These hardier selections are useful for areas like much of coastal California, the Gulf States and the tropical areas, as well as interior use. The temperate bamboo are quite frost hardy. 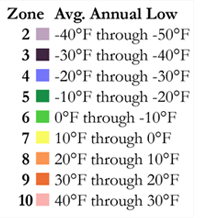 Some withstand temperatures to -20 F or USDA Zones 4 and 5. Most will grow around the country in Zones 6, 7, 8, 9, and many, in 10. Many do well as house plants. Bamboo Mealy bug can be a problem in Florida. Mealy bugs are detected by seeing a white web looking thing on the canes. The bugs are usually under this web. We have not ever lost an entire plant to this bug but it has done a job on some new canes. The best treatment we have found is a retail product called Bayer Advanced Tree and Shrub insecticide available at Home Depot or Lowe's. This product works for a year and seems to be very effective. The "Bayer" product is a systemic so takes awhile to become effective. In the meantime...visible Mealy Bugs should be sprayed with any good insecticide soap. The soap should be applied directly on visible Mealy bugs and repeated when new Mealy's crawl from their shelter under the leaf.